It was inevitable: At least one Bruin had to go away empty-handed from the Manhattan Beach Open Finals. The favorites were led by 39-year old legend Elaine “E.Y.” Youngs, who was going for her 48th Career Tounament Championship, which would place her 7th on the All-Time list. EY’s parter Nicole Branagh has been helping the pair dominate for the last three years, and that didn’t change this weekend. To cap off a gorgeous weekend in Manhattan Beach with a Trophy, EY and Nicole had to best an all-Bruin team of Annett Davis (how cool is it for a Volleyball player to be named “Annett?”) and Bruin Hero Rafer Johnson’s daughter Jennie Johnson Jordan. But Youngs showed no mercy to her fellow Bruins, as they swept the match, 21-17, 21-14. There was a Bruin in the Men’s Final as well — Kevin Wong — but like Davis and Johnson, fell just short of the Title. But knowing MOST OF YOU as I do, you barely care about any of this, and are already scanning the photos. Please enjoy these 18 photos from this weekend’s Tournament, of Volleyball Action, Alcohol Company Models, and the AVP Dance Team. "ONLY THE GOOD DIE (VS) YOUNGS" was published on July 19th, 2009 and is listed in Blue & Gold News, UCLA/usc/Sports Photos. T-H: Where are the photos of Jenny Johnson Jordan? Damn, last girl kinda looks like Brianna. In other words, she’s hot. Great site…..always enjoy dumping on USC. AVP rocks. I was there the frist day in Manhattan Beach. 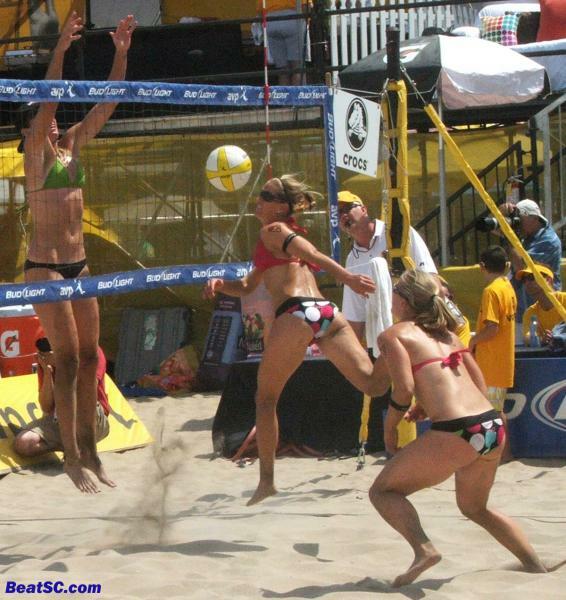 Hermosa AVP is this coming weekend.